Brands are buying more social advertising, and increasingly those ads build off of published content like Sponsored Stories and Promoted Tweets. To absorb this spend, social marketing platform Buddy Media has acquired and integrated the tech and team of Facebook ad-buying tool Brighter Option. Buddy Media started as social publishing suite, but as cheap publishing tools proliferated it needed a way to earn a percentage of brand ad spend. 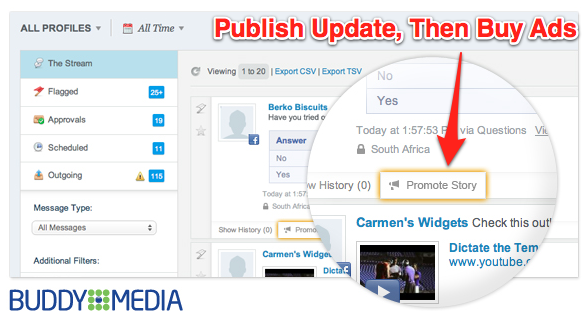 Now when Buddy Media’s 600 clients including newly signed WPP, the world’s largest advertising agency, publish updates to Facebook they can instantly buy ads that promote their owned marketing properties. The seed-funded Brighter Option‘s entire 21 person team in London and San Francisco will move into Buddy Media’s offices in those cities. 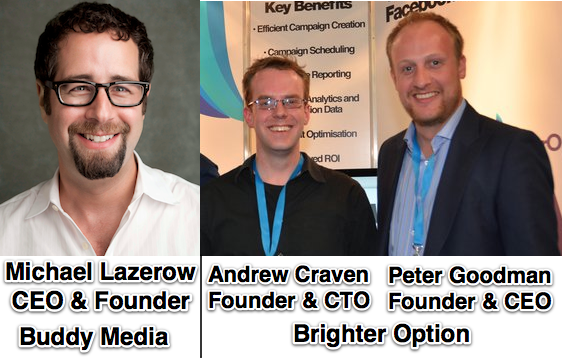 Brighter Option’s CEO Peter Goodman is likely to spearhead Buddy Media’s international expansion, while CTO Andrew Craven will join the senior product team. They’re now building ad tools that sync with Buddy Media’s Twitter, YouTube, Google+ and other social channel publishing capabilities. The price of acquisition was not disclosed, but the value comes from the synergy offered by a single tool that can publish owned, monitor earned, and buy paid marketing. Previously it was fine for brands and agencies to use standalone solutions. But social ads are on the rise. Right now they’re primarily on Facebook and Twitter, but the high click through rates of Sponsored Stories and Promoted Tweets could inspire Tumblr, Instagram, and maybe even Pinterest to build out content-based ad products. To efficiently repackage and amplify owned marketing like Facebook brand page updates and application usage stories as ads, the silos must be broken down. The Brighter Option buy continues the trend of consolidation between the social media marketing and advertising industries, following Efficient Frontier’s acquisition of Page management company Context Optional, and Experian’s purchase of Ads API tool Techlightenment. I spoke yesterday with Buddy Media’s founder CEO and founder Michael Lazerow, and he told me that a year ago it became obvious that his company needed to offer ad buying. Buddy Media began assessing its compatibility with over 20 Ads API tools that let clients efficiently buy large scale ad campaigns on Facebook. It decided a partnership wouldn’t be sufficient and it could take months to a year to build its own tool. In August Buddy Media took a $54 million Series D round bringing it to just under $90 million in funding. With growing revenue that may have reached $50 million in 2011, Buddy Media had the firepower to acquire a top tier ads tool — it just needed to decide which one. When Buddy Media took its Series D, I wrote about its glaring lack of an ad buying tool and suggested “it could acquire one of the smaller brand-focused Ads API developers such as Brighter Option, GraphEffect, or XA.net.” Lazerow told me he found that “Brighter Option was the only Ad API company that offed a tech solution without a managed service, and was incredibly easy to use.” As a pure software-as-a-service that was well received by agencies, it was a superior fit for Buddy Media. Last quarter, Brighter Option served 92.5 billion impressions for more than 291 advertisers in 42 countries including game studio Wooga, and agencies Blowfish Digital and Mediacom. The acquisition will roll these clients into Buddy Media, which will charge them a very competitive single digit percentage of total ad spend with a two-week free trial and no set up cost or monthly minimum. Many other ad buying tools and services require a minimum spend and can charge around 15% of spend. Buddy Media will also offer a transition service to allow advertisers to switch to it from other tools or manual ad buying.